The Roman Empire was formed in circa 27 BC by Augustus after the assassination of Julius Caesar. It was one of the biggest civilizations in the human history. During the first 150 years of imperial rule, Rome reached the height of its power. Ancient Rome was its Power Center. The Romans adapted the ancient Greek culture but they used the Roman law. They divided the day into 24 hours but the length of hours varied. There were 12 hours of daylight and 12 hours of darkness. Daylight hours were longer in summer as compared to in winter. The average life expectancy in Ancient Rome was from 25-30 years. The longest conflict in human history was between the Romans and Persians. Their wars lasted about 721 years. The Romans used urine to wash clothes and whiten their teeth. Roman gladiators rarely fought to the death or against animals. The Statue of Liberty was inspired by Roman Pagan goddess Libertas. Flamingo tongues were considered a delicacy in Ancient Rome. Romans built aqueducts, a system of channels and bridges that transported water for public baths and toilets. 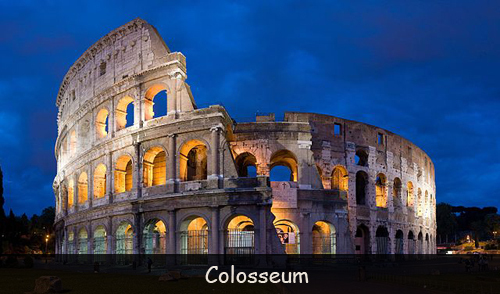 The Colosseum is one of the most famous buildings left by the ancient Romans. It is a huge amphitheater in the center of Rome. The tunic and toga were two general types of clothing popularly worn by ancient Romans. Their regular diet consisted of common staple food like wheat, posca, bread etc. The Roman army was really powerful. They could march up to 40 kilometers in a day. The Roman Empire occupied just 12% of the entire world’s population, even at its peak. Declan, Tobin. " Facts for Kids about Ancient Rome ." Easy Science for Kids, Apr 2019. Web. 18 Apr 2019. < https://easyscienceforkids.com/facts-about-ancient-rome/ >.